It’s Halloween, and that means plenty of free candy for kids who are out trick-or-treating today. But Halloween 2018 also arrives with deals available to people of all ages — like free Krispy Kreme doughnuts. Krispy Kreme’s Halloween deal is one of dozens offered by restaurant chains all over the country on October 31. IHOP, Chipotle, Baskin-Robbins, and BurgerFi are among the many other restaurants with special Halloween food deals today. Here are all the best Halloween freebies and deals you’ll find around the country on October 31. Happy Halloween! Krispy Kreme’s free doughnut promotion just may be the best Halloween deal of all: Anyone who shows up in costume at a participating Krispy Kreme shop today gets a free donut, in any flavor. The Chipotle Halloween “Boorito” deal is always a popular one: From 3 p.m. until closing on October 31, all customers in costumes can get a burrito, bowl, salad, or order of tacos for just $4 at Chipotle. Or you can skip the costume and get the same deal by ordering your $4 burrito online: Just enter the code BOORITO when placing your order at Chipotle’s app or website. ༼ つ ╹ ╹ ༽つ Boorito is back! Come in costume on 10/31 from 3pm to close for $4 entrées. Wear a costume to BurgerFi on Halloween and you’ll get a choice of free small fries or a free small custard. All regular or kid-size ice cream cones are specially priced at $1.50 each on October 31 at Baskin-Robbins. The Halloween deal at Sonic is $.50 corn dogs — all day on October 31, for all customers. When you order a monster-size or larger burrito at Freebirds on Halloween, you’ll get a free bottle of the fast-casual chain’s Death Sauce — which normally costs $8 — while supplies last. Text the word TRICK to 91681 on Halloween and you’ll get a coupon good for a free pumpkin smoothie with the purchase of one at regular price on October 31. All day on October 31 at Urban Bricks Pizza, customers can get a free pizza or other meal with the purchase of one at regular price. Kids 12 and under can get a free Scary Face pancake at IHOP, between 7 a.m. and 10 p.m. on Halloween. Kids in costume on Halloween can get a free kid’s meal at Beef ‘O’ Brady’s with the purchase of an adult entrée. Kids eat free on Halloween at Bubba Gump locations with the purchase of any adult entrée. 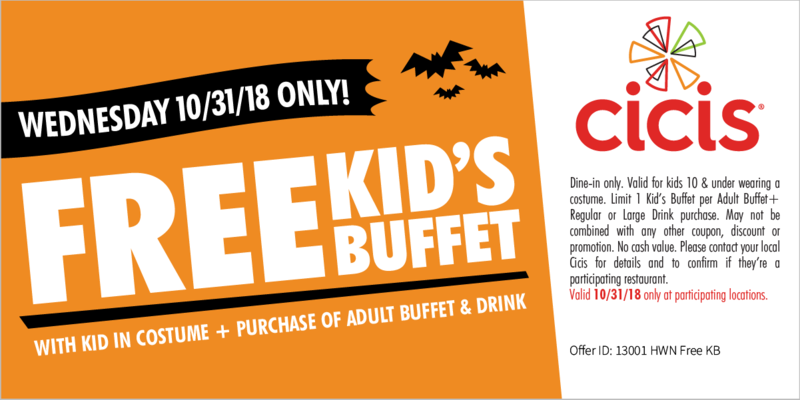 Show this coupon shared on Cicis Facebook page, and children 10 and under in costume get a free Cicis kids buffet on Halloween, with the purchase of an adult buffet and drink. Kids in costume eat free on Halloween, with the purchase of an adult entrée, at Cotton Patch Café’s 55 locations in Texas and nearby states. Show this coupon and kids eat free on Halloween 2018 at Joe’s Crab Shack, with the purchase of an adult entrée. Kids 12 and under in costume can get a free kid’s meal on Halloween at McAlister’s Deli, with the purchase of an adult entrée. Kids can get a free kid’s meal at Mimi’s Café with the purchase of an adult entrée on Halloween. All day on Halloween at 99 Restaurants locations, kids eat free with the purchase of an adult entrée. Kids in costume eat free on Halloween from the kid’s menu at Texas Steakhouse & Saloon, with the purchase of an adult entrée.